I am doing something I have never done before on this blog. I am posting a recipe that I have already posted once before. The reason is that the kosher link up for this month is Superbowl food (see below!). 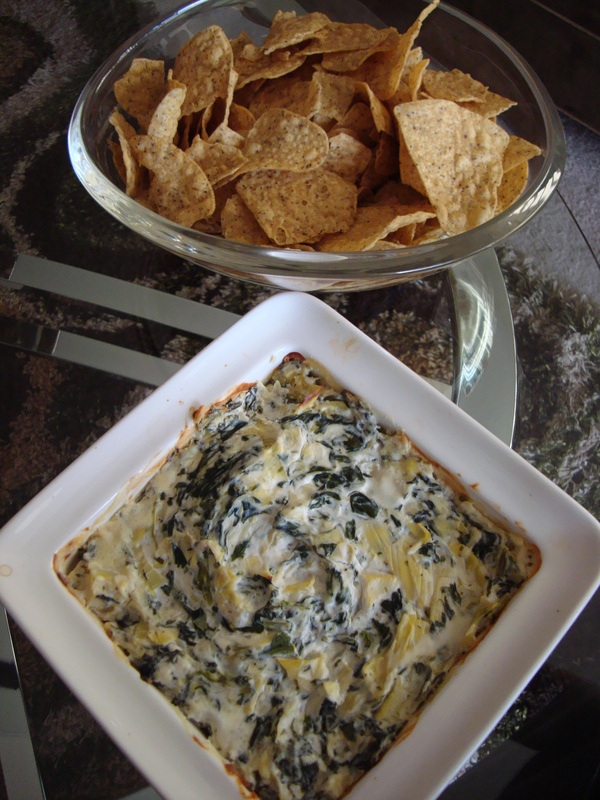 There are two recipes that I think are essential for the big game, my game day chili and spinach artichoke dip. Since I did the game day chili recipe last year for the Superbowl I decied that I would do the spinach and artichoke dip this year. Plus it has been two years since I posted this last and there are a lot more readers on the blog now. This dish is so good and I want everyone to try it! 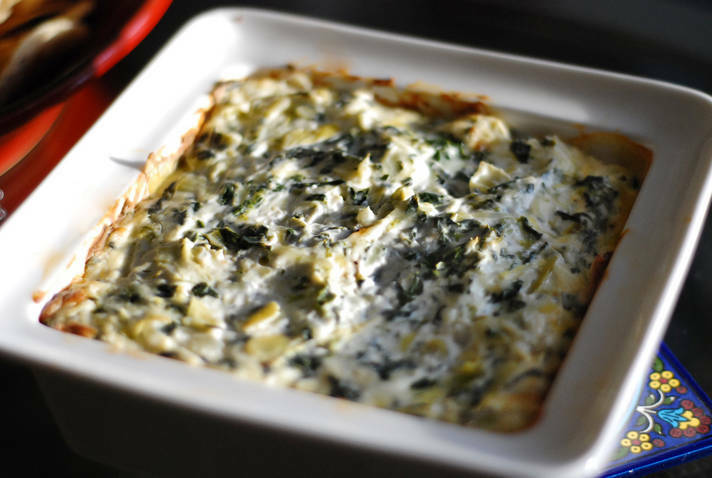 Who does not like spinach and artichoke dip? With tender artichokes surrounded by a hot, bubbly and creamy spinach mixture, what is not to love? Whenever I am at a restaurant and I see spinach and artichoke dip on the menu I HAVE to order it. My recipe is an attempt at re-creating the dip that I love, but making it a bit more health conscious. That way I don’t feel guilty making it for my family and friends all the time. It’s made with spinach and artichokes which are good for you, right? I am not going to say this is a fat free recipe, but I did reduce some calories and fat. My version is made with low fat dairy products as opposed to full fat cheese, cream and mayonnaise which are the typical bases for the recipe. The best part is that there is absolutely no sacrifice to the flavor. I have made this many times for lots of different people and no one has ever been able to tell that this is made with reduced fat products. It is always a huge crowd pleaser and is great for game day or any other day! 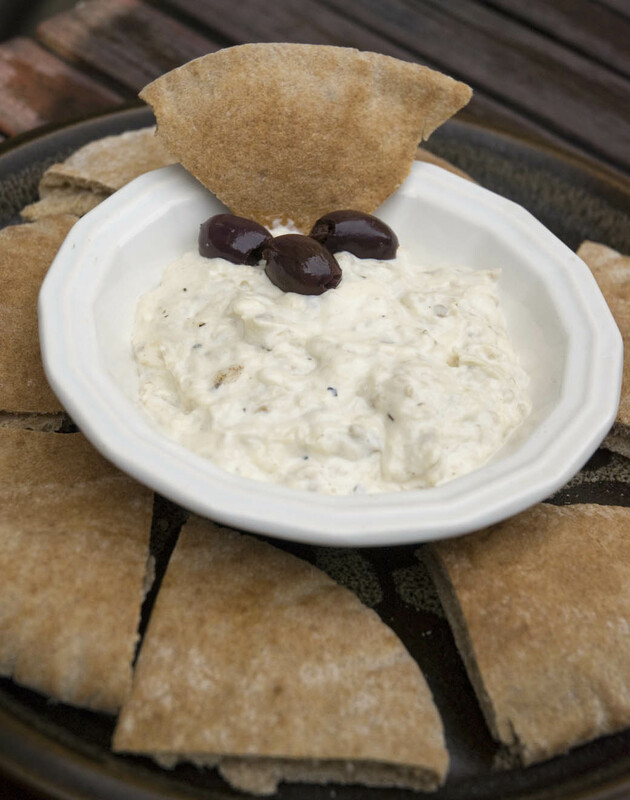 You can make the dip a day ahead, keep it refrigerated and bake it before you want to serve it. 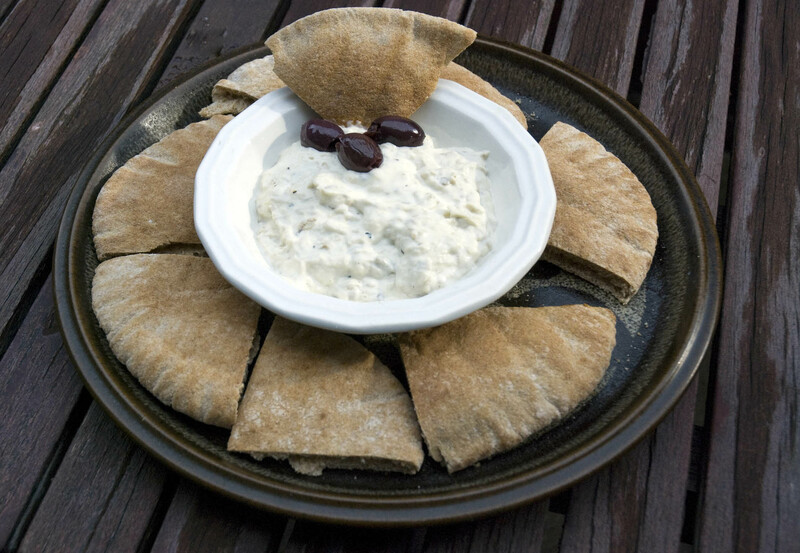 It can be served with tortilla chips, pita chips, baguette slices or crudites for an even healthier alternative. Bring your cream cheese to room temperature. Preheat oven to 350 degrees. Drain artichokes and rinse. Finely chop and let dry. Defrost spinach and squeeze ALL excess liquid from the spinach. 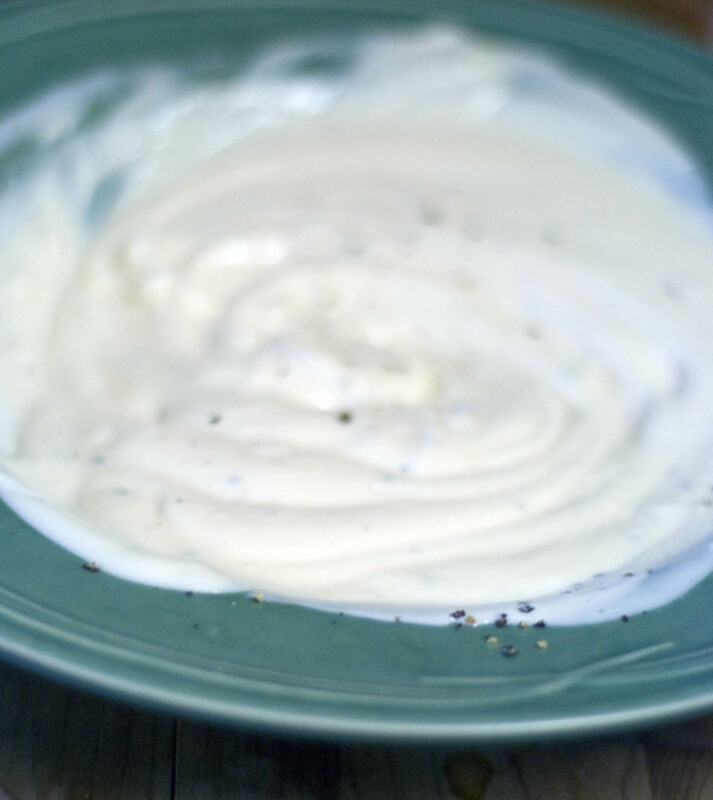 Mix cream cheese, sour cream, mayonnaise, cheeses and garlic in a large bowl. Add artichoke hearts, spinach, cracked pepper and stir until well combined. Spray either a square 8 inch baking dish, or 9 inch round glass baking dish with cooking spray. Pour mixture into dish and bake until mixture is hot and bubbly, about 30-35 minutes. I know this has a funny name, but for anyone who has never tried baba ghanoush do not let the name scare you. This is a Middle Eastern dip/spread/salad that is made of eggplant. It is often served as a starter to a meal, but can be used as a side dish as well. It is popular from Morocco to Israel and many countries have their own spin on it. My recipe is adapted from a recipe my sister Kathleen got from her mother-in-law who happens to be from Morocco and Israel. I have seen many different versions of this dish but the reason I like mine is, A – it is easy, B – you do not need any additional equipment like a food processor and C – it does not require babysitting the eggplant over an open flame. The cook time is over an hour. But most of the time the eggplant is just roasting in the oven and you only need to check on it every 15 minutes or so. Because my version cooks the eggplant in the oven as opposed to over an open flame there is not really a smokey taste to the baba. I personally do not mind, but if you want a smokier version you could either roast the eggplant over a gas burner or cook it on an outdoor grill using the same method I describe. I will also forewarn you that you really get the taste of garlic and lemon in my recipe. If those are not flavors that you particularly like you can always use half the amount I suggest. I do strongly suggest taking the time to paste up the garlic so that no one bites down on a large chunk. This is a really easy recipe to double, triple or even quadruple if you are making it for a crowd. I like to serve it with pita bread, pita chips, crudites, challah or as an accompaniment to meat or chicken. It can also be made the day before you plan to serve it. 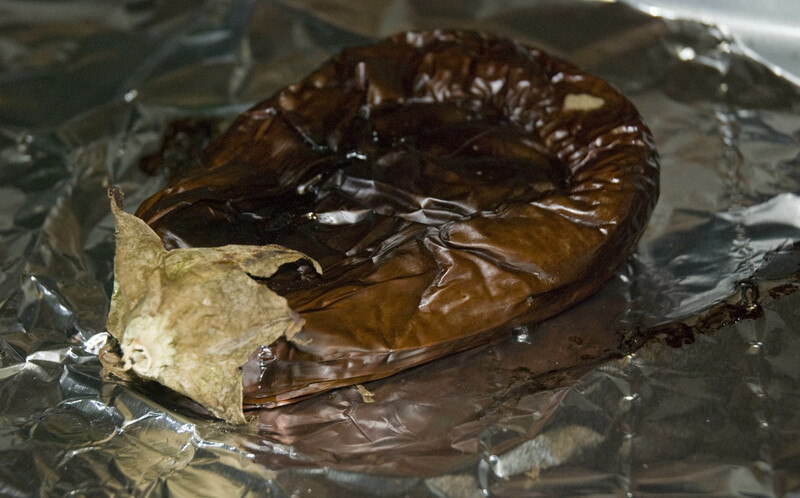 Place the eggplant on a baking sheet lined with tin foil. Prick the eggplant on all four sides with a fork. Place the eggplant into the oven on the middle rack. Cook the eggplant for one hour total rotating it every 15 minutes. Once the eggplant is cooked through it will appear deflated. Set it aside to cool. 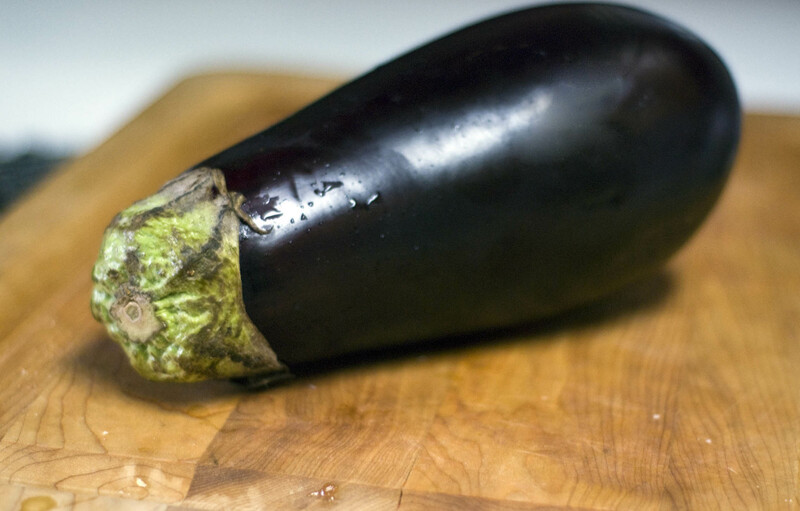 While the eggplant is cooking you can make the sauce. Chop the garlic or press it. Add a generous pinch of kosher salt to the garlic. With the back of your knife mash the garlic and drag it against the cutting board to create a paste. Place the garlic paste into a large bowl. Squeeze in the juice of half a lemon and add the mayonnaise. Add a few grinds of black pepper and stir everything together. Refrigerate the mayonnaise mixture while the eggplant continues to cook. Once the eggplant is cool scoop out the flesh from the inside, discarding the peel. 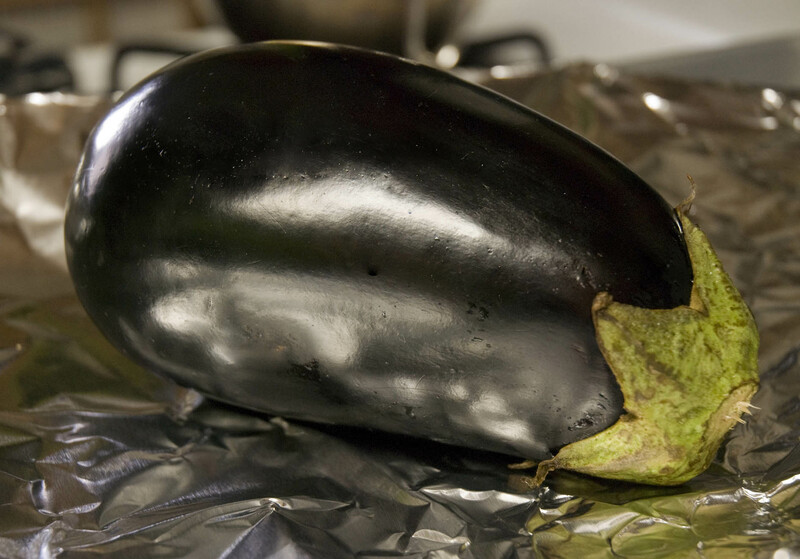 Place the eggplant into a strainer and let it sit for 30 minutes to an hour so that most of the juices drain. Chop the eggplant into small pieces and add to the mayonnaise sauce. Mix well and serve chilled. With the Super Bowl around the corner I thought I would share a great party recipe. Even people who do not watch one game all season watch the Super Bowl. That explains the multi-million dollar commercial slots. For me it is a great reason to get together with friends, enjoy good food and watch the game plus said commercials. Even if your team looses this recipe is a winner every year. Go Giants!